P&O Cruises Australia is a British-American owned cruise line with corporate headquarters at Carnival House in Southampton, England and operational headquarters in North Sydney, New South Wales, Australia. The sister company of P&O Cruises in the United Kingdom, it was previously a constituent of the Peninsular & Oriental Steam Navigation Company and has a direct link in history to the world's first passenger ships. As such, it is one of the oldest cruise lines in the world, and now forms part of the Carnival Corporation & plc, under the executive control of Holland America Line. It currently operates five ships, sailing from various ports in Australia and New Zealand. P&O Cruises Australia originates from the passenger division of the Peninsular and Oriental Steam Navigation Company, a UK shipping company which operated the world's first passenger ships in the early 19th century. P&O subsequently became the first company to operate passenger routes to Australia, with the first of these voyages occurring in 1932. These voyages eventually developed into the cruise holidays we recognize today and so P&O adopted the brand name P&O Cruises, with the specialist Australian service becoming known as P&O Cruises Australia. In 2000, after various changes in the organization of the P&O Group, the company de-merged all of its cruise ship operations. A new company was created, P&O Princess Cruises, which was independent of P&O and consisted of P&O Cruises, P&O Cruises Australia, Princess Cruises, AIDA Cruises and later A'Rosa Cruises and Ocean Village. Later in 2003, P&O Princess Cruises merged with Carnival Corporation to form Carnival Corporation & plc, the world's largest cruise company, with a portfolio of eleven cruise lines, including P&O Australia. The Pacific Sky joined the P&O Australia fleet in 2001 and was sold to Pullmantur Cruises in 2006, becoming their Sky Wonder. In 2004 the Pacific Sun joined the fleet. It was followed by Pacific Star in 2005. 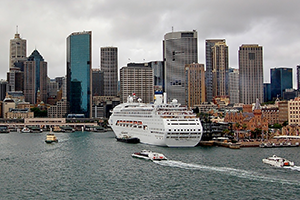 In October 2007, the oldest ship of Princess Cruises' fleet, the Regal Princess, was transferred to P&O Australia. After one month of refurbishment, she entered service as the Pacific Dawn. The Pacific Star was sold to Pullmantur Cruises in March 2008. She underwent refurbishment in Singapore and has started sailing as Ocean Dream from 11 May 2008. On 30 October 2008, Carnival Corporation & plc announced the closure of their United Kingdom-based Ocean Village brand. Coinciding with this closure, both Ocean Village ships were transferred to the fleet of P&O Cruises Australia. Ocean Village Two joined the P&O Australia fleet in December 2009 as Pacific Jewel. Ocean Village followed in late 2010 as Pacific Pearl. In October 2009, P&O Cruises offered assistance to the Red Cross in relief efforts for earthquake and tsunami victims in the South Pacific by donating 740 pillows with the promise of mattresses, more pillows and hundreds of light bulbs to be given a later date. In December 2009, the Pacific Dawn was moved from Sydney to its new home port at Brisbane. This was done to allow the Pacific Jewel and after its acquisition the Pacific Pearl to be based in Sydney. The Pacific Sun was moved to Fremantle for part of the year to carry out Asia cruises prior to being sold in July 2012. 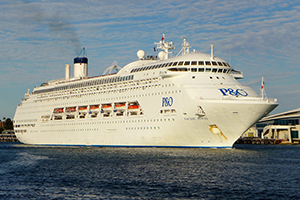 In December 2011, P&O announced The Pacific Sun would make its last journey for the company on 1 July 2012. In 7 years with P&O it carried more than half a million passengers. In May 2014, Carnival Corporation announced that the Statendam and Ryndam would be transferred from Holland America Line to the P&O Cruises Australia fleet in 2015 after being refurbished to tailor them for Australian and New Zealand passengers. The names for the two ships were revealed in July 2014 as the Pacific Eden and Pacific Aria. In October 2015 it was announced that the Dawn Princess would move from the Princess Cruises fleet to the P&O Australia fleet. In December 2015 a new ship was ordered at Fincantieri for delivery in 2019. Now, this ship will get delivered to Carnival Cruise Line, the Carnival Splendor will be transferred to P&O Cruises Australia. In March 2016, it was announced that the Pacific Pearl would leave the fleet in March 2017, having completed 294 cruises for P&O, carrying more than half a million passengers over five years. Pacific Dawn. Built: 1991. Entered service for P&O Australia: 2007. Gross tonnage: 70,285. Previously Regal Princess. Pacific Aria. Built: 1994. Entered service for P&O Australia: 2015. Gross tonnage: 55,451. Previously Ryndam. Pacific Explorer. Built: 1997. Entered service for P&O Australia: 2017. Gross tonnage: 77,499. Previously Dawn Princess. Pacific Adventure. Built: 2001. Enters service for P&O Australia: 2020. Gross tonnage: 108,865. Currently sailing as Golden Princess for Princess Cruise Line. Unnamed. Built: 2002. Enters service for P&O Australia: 2021. Gross tonnage: 108,977. Currently sailing as Star Princess for Princess Cruise Line.